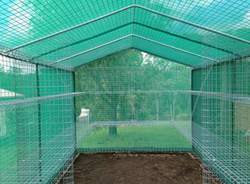 Pioneers in the industry, we offer garden shade nets from India. We have on offer for our customers a qualitative range of Garden Shade Nets & Flower Shade Net. These shade nets are designed by our diligent professionals who have immense knowledge in this specific domain. Quality HDPE, granule, colour-master batch and UV master-batch procured from trusted vendors are utilised in manufacturing these nets. Our products provide protection to flowering plants from harmful UV rays. Clients can avail these nets in varied grades of UV protection that provide 25%, 35%, 50%, 75% and 90% safety from direct sun rays. Extensively used in nurseries & farm houses, orchards and grape gardens, our shade nets have helped us garner a rich clientele in the market. We are known as one of leading Flower Shade Net Manufacturer and Flower Shade Net Exporter. Looking for Garden Shade Nets ?